WAIST HIGH: Happy 25th Birthday Songs From The Big Chair. Happy 25th Birthday Songs From The Big Chair. 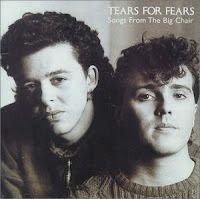 The second album from Tears for Fears, Songs from the Big Chair went to #1 in the US in July 1985 where it stayed for five weeks. The album also went to #1 in Canada and #2 in the UK and remains Tears For Fears' highest selling album; reaching quadruple-platinum status. "The album title was taken from the 1976 television film Sybil, which is about a woman with multiple personality disorder who only feels safe when she is sitting in the 'big chair' of her analyst." Five singles were released from Songs from the Big Chair: "Shout,"
"Mothers Talk," "Everybody Wants to Rule the World," "Head Over Heels," and "I Believe" (UK only). "Shout" went to #1 on the US singles chart, as did "Everybody Wants to Rule The World." Roland Orzabal would receive an Ivor Novello Award for Outstanding Songwriter of the Year at the 31st Annual Ivor Novello Awards in 1986 in the wake of the success of Songs from the Big Chair.